Hiya, everybody! 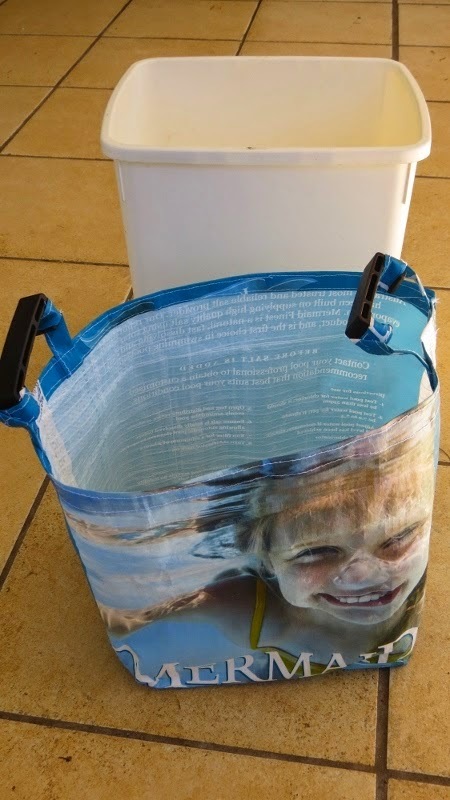 I thought you all might like a peek at a few terrific repurposed ideas I've seen recently. 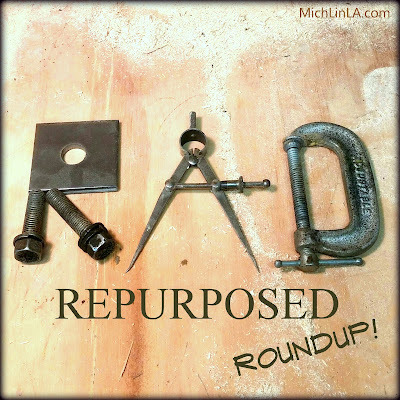 It's rad and it's a roundup! From Aunt Peaches: a mega-awesome sugar skull necklace, so simple to create 'cause it's made from iron-on patches. I just had to show you guys a closeup of those flat green disks. Nuthin' but circles cut out of plastic bottles! Don't they look great, the way she strung them between similar color beads? Finally, from The Answer Is Chocolate: Carol delighted me with this very clever off-label use for a Christmas snowflake form. 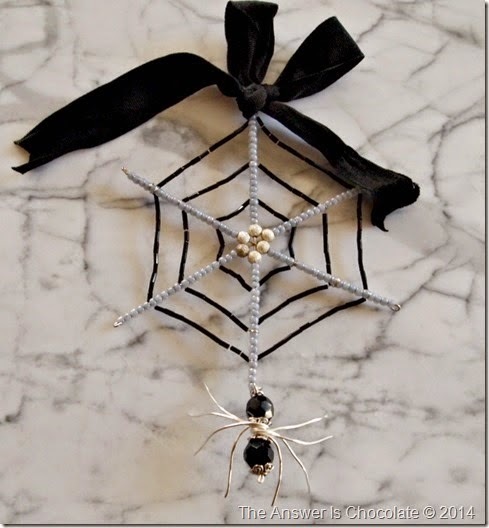 She converted it into a beaded Halloween spiderweb! So that's what I've been admiring around the web this week. I sure hope you enjoyed these random finds...let me know if you think I should make this a regular feature! I do, I do! Oh yes,make it a regular feature. I always love seeing your projects and to see the projects YOU are lovin' would be great. Love all your picks! Thank you so much for featuring my chandelier crystal earrings. And I am still looking for more colourful bottle caps to use! Oh my goodness thank you so much for the feature!!!! This made me so happy. I love everyone's creativity! Thanks so much for the feature Mich! :) I love all the features here - but have to say those bottle cap earrings are my favourite - they are awesome!! 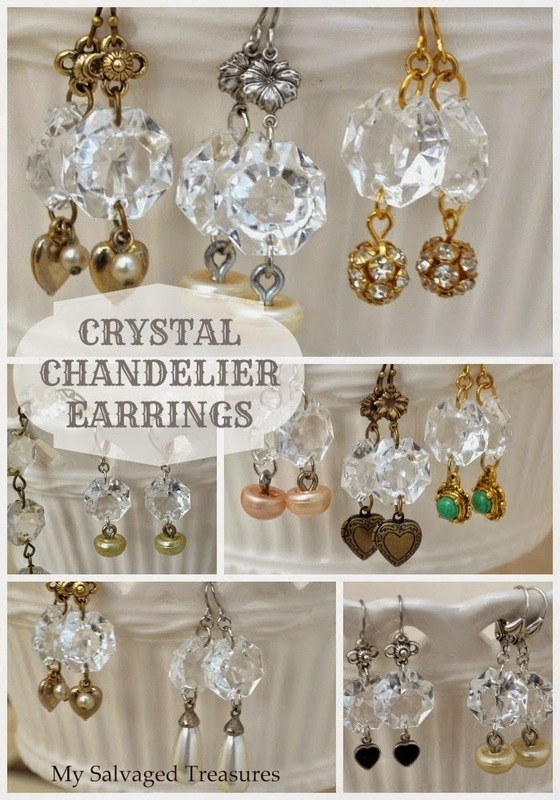 These are all great ideas, but my favourite is the chandelier earrings! Oh my goodness. What amazing features you picked and I can't believe you included my spiderweb. Thank you. I think you should definitely make this a regular thing! Great choices. wah wah waaaahhh..so many cool ideas, thanks for sharing with us! I am going to Aunt Peaches now..saw her after ages lol..
Oh yes.. please do make this a regular feature. I love seeing what creative people come up with but usually don't have time to seek them out. I've already bookmarked a few of the sites so I can go back and visit them again. Awesome roundup and a great introduction to other creative minds! Thanks for the feature on my scarf rings (which also make easy napkin rings) and looking forward to more. A recap from my favorite jewelry blogs. How did Shannon cut the bottles in perfect circles? Jill, a great way to use the ski clip doohickies! Love the sparkly chandelier earrings from My Salvages Treasures. Pearl, I have made your scarf rings for my scarves, I've always loved Aunt Peaches' ideas and my answer is Always Chocolate. Great post Mich! I have used other brands but these are the best. You can also punch aluminum cans for jewelry. cool stuff. especially like the scarf ring idea. it's getting colder and I am wearing more scarves. Wow! What a fun round-up and yes, I would love to see this as a regular feature! Mich, you sure have an eye for the sublime, quirky and unusual. 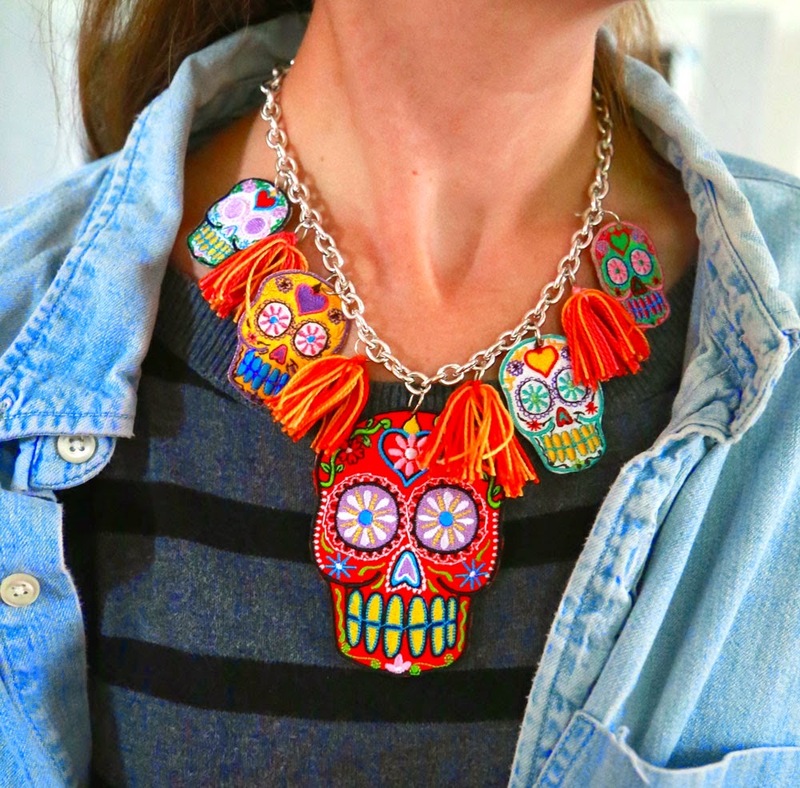 I just adore the sugarskull necklace! I wish you would come link stuff like this up with us at our weekly linky party. Tomorrow a new party opens. Maybe see you there?? !